The Art Institute of Mill Street Loft + Spark Media Project is partnering with prestigious arts colleges to provide merit scholarships to local students. The Poughkeepsie organization, which provides advanced arts and media education to youth ages 14-19, is announcing two new scholarships which will offer graduates merit-based awards to attend Moore College of Art & Design and Montserrat College of Art. Art Institute staff will choose deserving high school seniors to receive scholarships to the two colleges. Moore College of Art & Design, a woman’s school in Philadelphia, has created a scholarship fund specifically for Art Institute students. The scholarship is designed to honor the role that art teachers play as mentors to aspiring artists. Beginning in the fall of 2018, one student will receive an award, renewable over four years, for a total of $20,000 towards attending Moore. 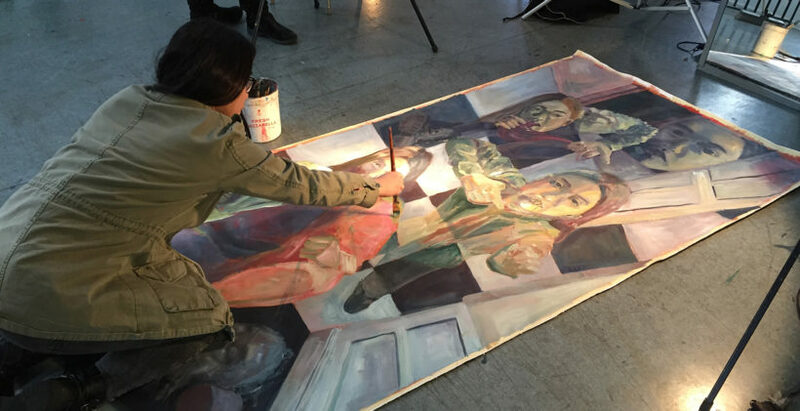 In a similar initiative, Massachusetts school Montserrat College of Art, will award up to five Art Institute graduates with scholarships of $16,000 per academic year, to reach a total of $64,000 over the course of 4 years of study. The Art Institute is not a newcomer to helping students achieve enrollment in college arts programs, and scholarships to support youth in attending the school of their choice. The Art Institute is a pre-college portfolio development program for students interested in a career in the arts, and aims to place every student in college on merit scholarship. Graduates of the Art Institute have been offered more than $42,000,000 in merit scholarships since 1996. The Art Institute offers a variety of courses, including filmmaking, painting, sculpture, animation, photography, and drawing, where students prepare competitive portfolios to gain college admission and work towards careers in the arts. In addition to helping students cultivate foundational skills in a variety of mediums, the Art Institute offers portfolio development and scholarship preparation courses to help local youth appeal to the nation’s top art schools. Students will have the opportunity to impress colleges at Portfolio Day from 4-8pm on November 3rd at the Henry A. Wallace Center. Representatives from over 39 colleges will critique student work, interview potential applicants, and provide information on the programs offered at their schools. College representatives from across the country will be in attendance, including Maryland Institute College of Art, Pratt Institute, The School of the Art Institute of Chicago, Columbus College of Art & Design, Rhode Island School of Design, Montserrat College of Art and Moore College of Art. Portfolio Day is a free event open to teachers, parents, and high school and college students interested in attending a college art program. For more information, visit https://feelthearteffect.org/events/portfolio-day/.